Ta'am Yisrael: A Taste of Israel is an 8th grade educational experience in Israel designed to give the participants a meaningful, intense, emotional and focused taste of the land and their heritage through a week long, "hands-on" experience in Israel. How do we fill a week? 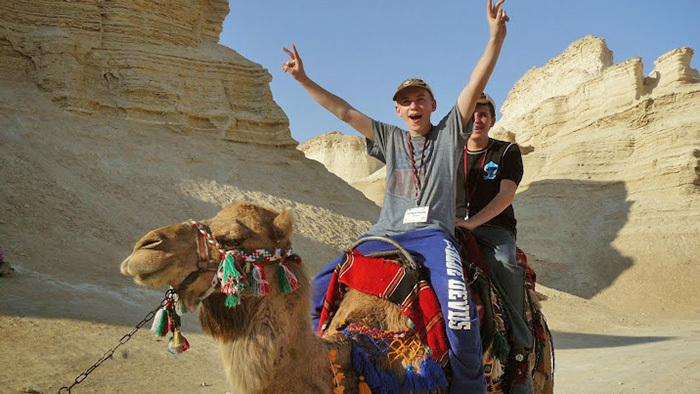 Explore Jerusalem and Tel Aviv, archaeological digs, trek through the Negev desert and swim in the Dead Sea, visit historical sites and museums, make friends with Israelis, engage in social justice projects and much more! Ta’am Yisrael strives to strengthen the participant’s Jewish identity while helping them build a deeper connection with Israel. The program encourages students to continue their Jewish education and involvement in their post-Bar/Bat Mitzvah lives through continued engagement in Jewish learning experiences and youth/community programming. Want to learn more? Check out the FAQ! Mark your calendars for these upcoming CFJE events . Two Ta'am Yisrael trips in 2020!